Obituary – Murphy, Laura Luella “Polly” (Hamblin) « Perry High School Alumni Association, Inc.
﻿L- age 17, is the daughter of Mr. and Mrs. H. B. Hamblin. She was born August 5, 1923, southwest of Perry. She attended Lawn View rural school and Hayward high school, and has attended the Perry high school for the past three years. She served as secretary and treasurer of her class while she was a freshman. She also is a member of the 4-H organization, and was a member of the glee club during the freshman year. Hobbies are playing the piano and dancing. Laura plans to live in Ponca City with her sister and to find employment either there or in Newkirk after her graduation. Funeral was Tuesday afternoon at the Community Christian church in Ponca City for Laura L. “Polly” Murphy, 72, a former resident of the Perry area. Rev. Wayne Majors officiated. Burial was in Resthaven Memorial Park cemetery under direction of Trout Funeral home of Ponca City. Casket bearers were Edwin Baade, Wallace Officer, Orville Thornton, Buford Weaver, Jim Cheek and Keith Burge. Memorial contributions may be made to Hospice of Ponca City, Inc., 1904 North Union street, Suite No. 103, Ponca City, OK 74601. Mrs. Murphy died Saturday, Dec. 30, 1995, at her Ponca City home. She was born Aug. 5, 1923, near Perry. Her parents were Bernard and Ica Dora (Parker) Hamblin. She was a 1941 graduate of Perry high school. On Feb. 7, 1942, she and Carl James Murphy were married in Lawton. The couple moved to Ponca City in 1945. Mrs. Murphy was employed at McDonald’s Department Store, the Homer Luther Music Store and Rich’s Bakery. She was a member of the Community Christian church. 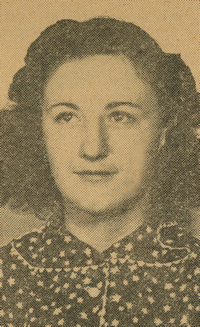 In addition to her husband, of the home, survivors include one daughter, Judith S. Williams, Tucson, AZ; one son, Carl “Jim” Murphy Jr., Shawnee; two brothers, Marvin Hamblin, Ponca City, and Melvin Hamblin, Payson, AZ; two sisters, Elma Shepherd, Locust Grove, and Bertha Roach, Tulsa; three grandchildren and two great-grandchildren. Local relatives include a nephew, Charlie Hise, Perry. Mrs. Murphy was preceded in death by her parents, two sisters and one brother.